A sleepy section of downtown St. Paul will get a dose of Hollywood glitter in coming weeks during the shooting of "A Prairie Home Companion," the movie. The film, directed by Robert Altman and written by Garrison Keillor, is based on Keillor's extremely popular public radio show. Most of the shooting will take place where PHC is performed, The Fitzgerald Theater. St. Paul, Minn. — After weeks of preparation, the movie crew has left its mark on the Fitzgerald Theater. General Manager Brian Sanderson says they've been working hard. "Our lobby which used to be kind of a creme, shades of crème is now dark green, dark brown, and various other colors," he says. "The backstage area, where our basement area is, is now becoming the dressing room scenes for the movie. Our rehearsal room is now becoming the barbershop for the movie, and our green room which is a performers lounge is now becoming the kitchen in the movie." The movie is a fictionalized account of the last broadcast of a 30-year-old radio show, not unlike A Prairie Home Companion. It stars Garrison Keillor as the show's host. Such Hollywood heavyweights as Meryl Streep, Lindsay Lohan and Kevin Kline are Keillor's co-stars. Some Prairie Home regulars will also have roles, including Sue Scott. She plays Donna the make-up artist. Scott has had acting stints in a couple of films and quite a few TV commercials. She says if she's shooting a 30 to 60-second TV spot, she knows she's in for a 12-hour day. "It's a major, major, major production number. And I sort of expect this to be that, times so many weeks." Scott is excited but not star-struck by her fellow cast members. She's had experience working with big names on the radio show. "You know, the egos get checked at the door," Scott says. "And everybody just sort of gets thrown in the soup together, and everybody just sort of puts out a good production. And I'm hoping and assuming that that will be the same with this film. But I'm tickled to meet some of these people, of course." As for the prospect of celebrities in the movie being thrilled to meet Prairie Home Companion regular Sue Scott. "Oh I'm sure. Of course. 'Oh my God! Are you Sue Scott?' Yeah!" she laughs. The movie being shot in St. Paul is good news for Minnesota's beleaguered film industry, which has had trouble attracting high budget filmmakers in recent years. Meighan McGuire, Film Liaison with the Minnesota Film and TV Board says it feels good to have Hollywood pouring money into local coffers once again. "The film, we know, is more than $5 million and probably less than 10." McGuire says the movie has also reminded people that the agency is still active. She says a lot of people in the local film scene thought the film and TV board had been eliminated. When news of the movie got out, people started calling again. "It's also people that live on the coasts, the studios that we were doing films with for so many years," she says. "Once they saw that Robert Altman was coming here it was like 'Hey, you guys are still around. We ought to call you. We ought to talk about some projects.'" Given the movie's star-studded cast, many are anticipating celebrity sightings galore around the Twin Cities. But Fitzgerald Theater General Manager Brian Sanderson says they may be disappointed. Sanderson expects the shooting schedule will be quite grueling for the actors, and they, with the possible exception of Lindsay Lohan, may be too tired to be out and about too much. Maybe he's just trying to provide them cover. Sanderson does believe the movie could bring new audiences to A Prairie Home Companion, the radio program. "You have the Garrison Keillor fans from the radio show which is what? Five million? And then you have Robert Altman fans. And then all the stars must draw people in to the see the film. So it may broaden his listening audience. Then again they may already listen to PHC. When there's five million people, that's quite a few. 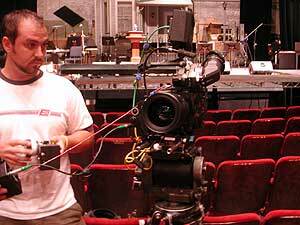 Production on the movie, "A Prairie Home Companion," runs through August 2nd in downtown St. Paul.